A Brit girl living in Penn's Woods. For lovers of gardening, books, crochet, teatime, travel and most of all kindred spirits. After two months in Europe, including a trip to Norway, I'm now settling into the 'R' world of retirement and all that goes along with that, the good and the bad. I honestly can't say that Holkham Hall is my favourite stately home, but you can't deny it's grandeur. Here are a sampling of the rooms. The Parrot Room. This room in Stranger’s Wing forms part of the principal guest accommodation area in one of the private wings of the Hall. The room takes its name from the painting by Frans Snyders, of parrots and macaws, which hangs by the bed. 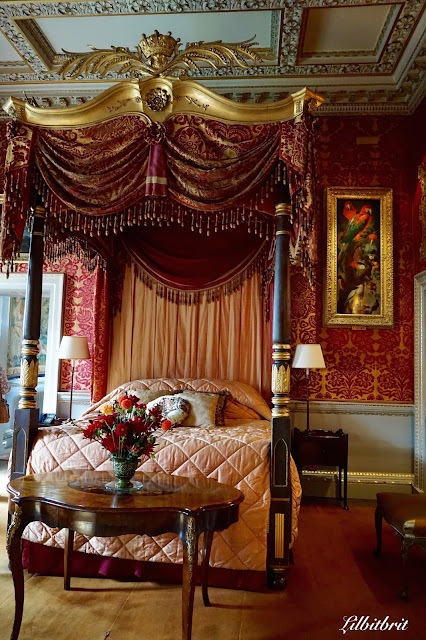 Guests of the Earl and Countess of Leicester often stay in this bedroom and it is therefore not always open to the public. Jeremy Musson, the presenter of the BBC’s ‘Curious House Guest’ slept in this room while filming the programme on Holkham, which was broadcast in March 2006. The bathroom, goes without saying but I don't know anymore about it. The Grade II listed fountain to the south of the Hall depicts Perseus and Andromeda, a Greek legend where Perseus rescued Andromeda from being sacrificed to a monster to appease Poseidon, the Sea God. The fountain was created by Charles Raymond Smith and was built circa 1850. The fountain ceased operating in 2009 when the iron pipe work, to and from it across the south lawn became so corroded that it could no longer hold the water pressure and burst in multiple places. 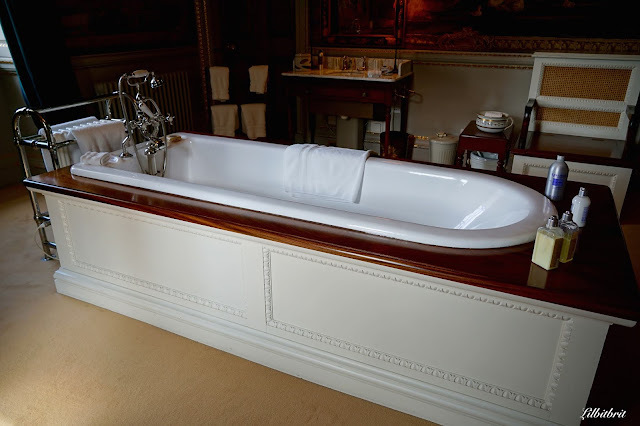 The water was originally supplied by a reservoir at the top of the deer park, which was fed by a borehole located under the former stable block in the courtyard adjacent to the Hall. From here the water was pumped uphill and then allowed to flow back to the fountain. It would use 400 gallons (1818 litres) of water per minute and as a result, the fountain could only be run for 20 minutes at a time, before the water source ran out. An alternative solution needed to be found and in autumn 2015 work started on a restoration programme to return the fountain to working order. The 7 month project costing in excess of £200,000 was carried out by Suffolk-based, Miles Water Engineering Ltd. The restoration incorporated a new underground pump room in the park. This houses the pumping and filtration equipment used to recirculate water from the bowl of the fountain through the twenty-five water jets secluded in the sculpture. Filtration keeps the water clear and clean. In addition to the fountain’s mechanisms, important repairs were carried out to the various fountain spouts and pipework. Repairs to the various statues were sensitively carried out to by Messenger Conservation Ltd of Stamford in Lincolnshire, specialists in stone work. The new system now allows the fountain to be run for longer periods of time and can be controlled from within the Hall. 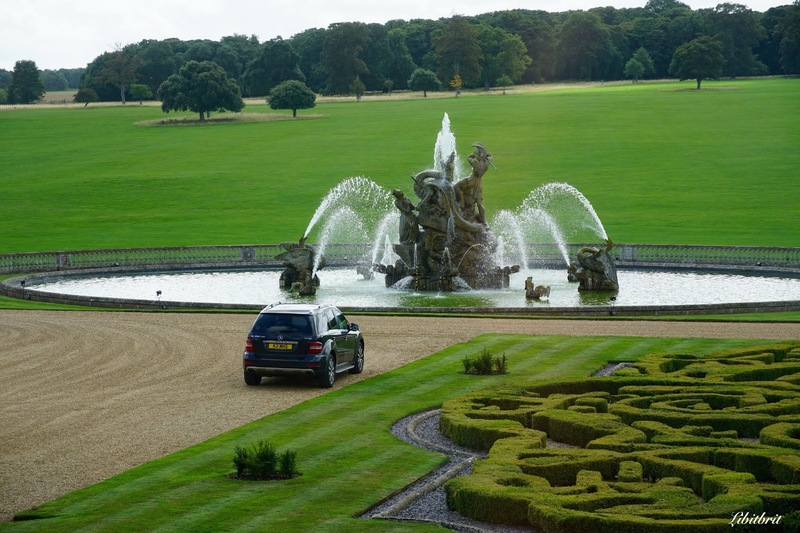 The result has been that as from April 2016 the fountain is back in full operation and has once again become a focal point for visitors to the Hall and park. Viewed from the south state rooms. The Libraries form half the area of the first floor of Family Wing and are known as the Manuscript, Classical and Long Library. Until the early 19th century, the Manuscript Library was the principal bedroom, which gave Thomas William Coke, convenient access to his library at any time of the day or night. However, by 1816, knowledgeable friends convinced Coke of Norfolk that he should retrieve the valuable manuscripts stored in one of the tower rooms - that were at risk from damp and neglect - and turn the bedroom into a library. Some of the manuscripts are from Sir Edward Coke’s original library. 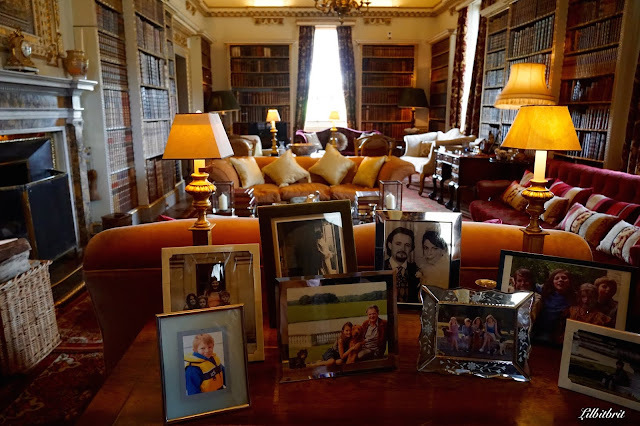 The Classical Library was once the ante room to Coke of Norfolk’s bedroom, but when he converted it into a library, this room became home to a number of early printed books. The Long Library is most used by the family for entertaining. It occupies the entire west front of Family Wing, and is 54ft long by 18ft wide. 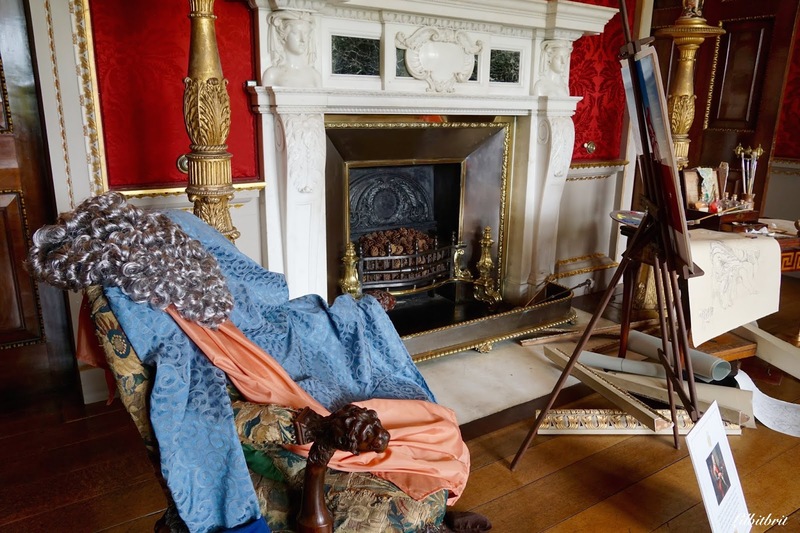 The room was designed by William Kent and a concealed door to the right of the fireplace leads to the main staircase of Family Wing, which would have allowed servants access to the room, without disturbing people in any of the other rooms on either side. The Landscape Room. 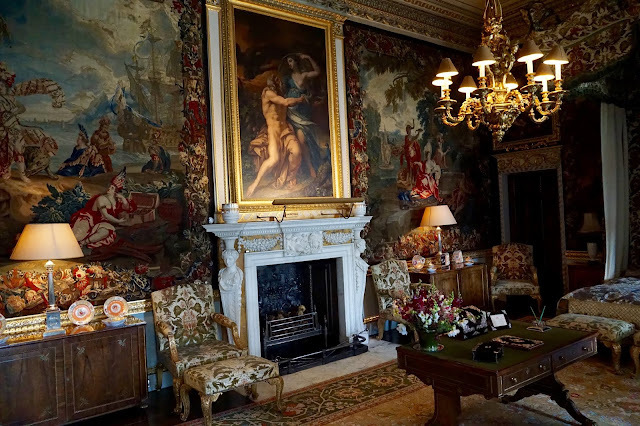 This room contains 22 Old Master pictures hung in the 18th century manner, one above the other. It is likely that Thomas Coke, 1st Earl of Leicester of 1st creation and the builder of the house, had settled the picture hang by the time he died in 1759, and as such, the detail is recorded in the inventory of 1760. The 7th Earl of Leicester recreated the hang and also had a new crimson damask woven for the walls and sofas using a favourite pattern of the William Kent period. As the name of the room suggests, all the paintings are technically landscapes, although in fact a number of them use landscape as the setting for biblical or mythological stories. 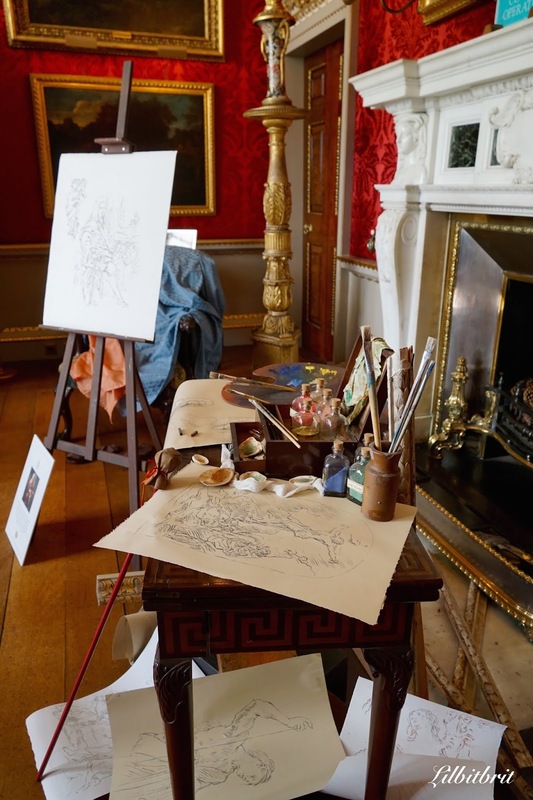 The outstanding feature of this room is the collection of seven paintings by Claude Lorrain (1600-1682), the great French landscape painter. Claude was most probably the most sought after by English collectors, not least because his idyllic views provided the models which many patrons attempted to emulate in the creation of their own parks and gardens. Thomas Coke bought at least two Claudes on his Grand Tour, another two in 1749/50 and Matthew Brettingham acquired two more from Cardinal Albani’s collection in Rome in 1752 when he also authorised Brettingham to spend what was necessary to secure the two paintings by Claude-Joesph Vernet which now hang in this room. Christine, this place is fabulous. It's very warm, isn't it? Even though there's a formality to it that you would expect in such places, you also feel like you could kick your shoes off and snuggle up here. I love the room with the easel and the photos of family. I saw a lot of William Kent things when I was in England. I need to look him up -- quite the repertoire! Yes I did think some of the rooms were very cosy, but some were more formal. One of my favorite houses is Lanhydrock in Cornwall. My goodness, such opulence and beauty a feast for the eyes. Yes so much to look at and take in. I love the fountain. Amazing they got it all going again. Visit Lilbitbrit's profile on Pinterest. The Cleaners Who Are They? 30th August 2018 Coke Hat or Bowler Hat? What Was Your Childhood Regimen? Which Shakespeare Play Captures Your Love Life? Is There Something You Would Like to Find, May I Help You? The heart that not yet - never yet — ah me! Made answer to my word. That tracks her night by night. Fallen on a turf grown green. The new changes in European Law is confusing, however I need to share this information with readers to comply. Thank you for reading and following my Blog Lilbitbrit and leaving comments to my blog posts. If you do not agree with the content, please do not leave any personal information on this blog. On my blog I share some of my life. I also share links to other blog posts. I write the posts and share photographs on my blog Lilbitbrit, I am the owner and the only administrator of my blog. All the content of this blog is mine or I clearly write the source (e.g. YouTube videos). I do not make money through my blog. My blog's followers and/or visitors' information is safe. No one can use, download, share, copy, or taking anything from this blog, neither can they collect any data from this blog. My computer has up-to-date security software installed and my blog has a strong password. I share photos of my life, on my social media accounts (all links are provided here on my blog), as well as links to other blog posts where I have also shared that information. Only photos of my life and links to blog posts are visible on my Social Media accounts, and content from this blog is visible only on my blog. My blog is family-friendly and minor-friendly. I am not responsible if minors visit my blog. No minor is invited to leave their data on my blog. If I notice any such activity on my blog, all such data will be deleted immediately and permanently without prior notice to the minor. No data on this blog nor any content of this blog is permitted to be shared with any third party or allowed to be downloaded, copied, etc, by any person. Data on this blog is provided only by followers and visitors to this blog, as well as by the subscribers. Any personal data shared here on my blog can be deleted permanently from my blog as stated below. Data are stored securely and solely used to run this blog, as described below. Laws have changed so i need to let you all know the changes, if I keep blogging I need to make you all aware. Those following this blog do so in their knowledge that their photo, link to their profile and name are visible to all those who visit this blog and in that they have published their own personal details. If you don't want your personal data as mentioned above to be visible to others who visit this blog, please remove yourself from the Followers list (so you will unfollow my blog). If any technical difficulty occurs, you should contact Blogger or Google to solve these problems. Registered users of my newsletter (via feed services) can, wherever they wish, stop receiving my newsletter. Those leaving a comment on this blog do so in their knowledge that their name, link to their profile or blog, as well as the comments they leave, are visible to all those who visit this blog and they are thereby consenting to the use of their personal information for that specific purpose. Blogger provides an option for all users to delete comments they leave on any blog. If you wish to delete your published comments from my blog, you are free to do it. Disturbing, violent, offensive or advertising comments will be deleted from my blog immediately. And I report you to google. If you want to disable cookies you may do so through your web browser options. Instructions for doing so can be found on the specific browser's websites. Accepting a cookie does not give me access to your computer or any personal information about you. Like many other websites, a visit to my blog will automatically create a log file, held securely on Google servers. The information in the log files include: internet protocol addresses (IP), types of browser, internet service provider (ISP), date and time stamp, referring and exit pages, number of clicks.